Despite what Weiss seems to be saying, I don't understand how he'll be able to avoid starting Collison. At the very least, he should be playing 25-30 minutes a night. He's the only guy at the 4 who can score, rebound, and defend. Plus, he's one of the smartest players on the squad. Pete, you said that word--risk. The aversion to which is what drove many of the moves, and non-moves this offseason. The new coach, the free agents, the departures were all very safe, largely uncontroversial decisions. But I can't really fault them considering they don't have the free-spending ownership or the talent base to make deals and attract bigger free agents. So we're left to hope they can do it like the Pistons and the Patriots--winning as a result of the chemistry between one superstar and a bunch of team-first guys. The only problem is that the Pistons and Patriots ARE willing to take on big contracts, as Corey Dillon and Rasheed Wallace illustrate. Yeah, those teams let players go all the time, but they are also led by people like Belichick and Larry Brown - and I don't think Bob Weiss exists on their coaching stratosphere. *If Reggie Evans is re-signed, then General Manager Rick Sund should try to acquire small forward Paul Pierce from the Boston Celtics for Lewis and Fortson. In other news, Mickaël Gelabale recently signed a contract extension with Real Madrid that goes through 2008; he will most likely never play for the Seattle Supersonics, just like both Peter Fehse and Paccelis Morlende, so he is nothing more than a figurative non-entity. In the end, ultimately, all three of them should either be traded or, if nothing else can be done, renounced. That's alot of work, AK. My only quibbles would be the lineup of Murray, Wilkins, Brunson, Moore and Fortson/Evans that you throw out for the beginning of the 2nd and 4th Qs. I think it would be more likely that the Sonics will rest Allen OR Lewis OR Radmanovic (or a combo thereof) at that point, not all of them. Then, when either Allen or Lewis return, the other would sit. Otherwise, the team would go into a black hole offensively. I also think Ridnour will be getting more minutes this year (not that I think that's a great idea). By your system, he'd be playing 32 minutes, but in reality it will have to be closer to 35. That said, it's nice to see someone else is as interested in the Sonics' season as we are. (As for Paul Pierce, man, you've got to let that go. Plain and simple, neither the Sonics nor the Celtics are interested in that move, so it flat-out is not going to happen). David Locke reports that Reggie has signed. I guess we'll find out if we really overachieved or we really were that big of a matchup nightmare. Heres hoping for matchup nightmare. Reggie has re-signed for a qualifying offer! Our bench has to be the best value in the whole NBA, and now we can pay Ray Ray a huge amount NOW if we want to, to have more money say in 2006-2007 when Rashard, Nick, and Luke get a chance at free agency. Who knows if Vlade and Reggie will be back, but if they want huge bucks in the future we should be happy to pay em next to nothing for now. Can you say "too much talent"? Sonics are ready to roll, now that Reggie goes to training camp only a day late. If Cleaves is actually signed, does that mean there are no spots left for Camp Invitees? Will someone get cut, or can they make the team some other way? 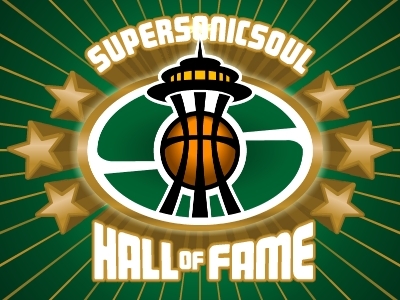 I don't know the Supes nearly as well as almost everyone on this board, but when I look at the Sonics line-up, "too much talent" isn't the first thing that comes to mind. Yeah, with the Evans' signing complete, the roster is currently full; Matten Cleaves signed a one-year, guaranteed contract worth $835,810. Anyhow, with Evans still here, there is no need on the club for Danny Fortson -- and yeah, I have conceeded to the likelihood that the only green Paul Pierce will be wearing is Celtic -- therefore, trading Fortson away for a player with an expiring contract who can be released (e.g., Scot Pollard of the Indiana Pacers) is the best thing that the team can do with him; it would allow for a guy like Tre Simmons to make the roster this upcoming season, as well as save a lot of money ($6,909,091) during the 2006-2007 season. At any rate, though, with the off-season finished, I give Rick Sund a B+. Hell, the only two moves I disagreed with him on were the re-signing of Vitaly Potapenko to a two-year, $6,315,000 contract -- as he deserved nothing more, based on his production, than a one-year, $1,035,000 contract -- and the matching of the five-year, $14,500,000 contract tender that Damien Wilkins received from the Minnesota Timberwolves; Wilkins could have easily been replaced by a non-drafted rookie free-agent, which is all that he was last season, who would earn $398,762 this upcoming season. On the other hand, however, Sund's replacing of Jerome James and Antonio Daniels with Mikki Moore and Rick Brunson, respectively, were smart, cost-efficient moves. In other news, James is just the ELEVENTH highest-paid player on the New York Knicks -- with only youngsters Channing Frye, Nate Robinson, David Lee, and Trevor Ariza, who are all still on their rookie contracts, earning less than him -- nonetheless, I'm sure he'll happily earn $30 million over the next five years as either a backup or third-string center; Isiah Thomas is a complete and utter joke. "Matten Cleaves signed a one-year, guaranteed contract worth $835,810." You know this how? None of the papers have reported it's guaranteed. We need Evans AND Fortson- that's 12 fouls to throw at Duncan and the like! I love DaFort. Remember when he sat on Brad Miller? Or when he kicked Manu in the nuts during the playoffs? This team needs his toughness, and Weiss likes him too, so don't expect to see Fortson packing his bags any time soon. I agree. 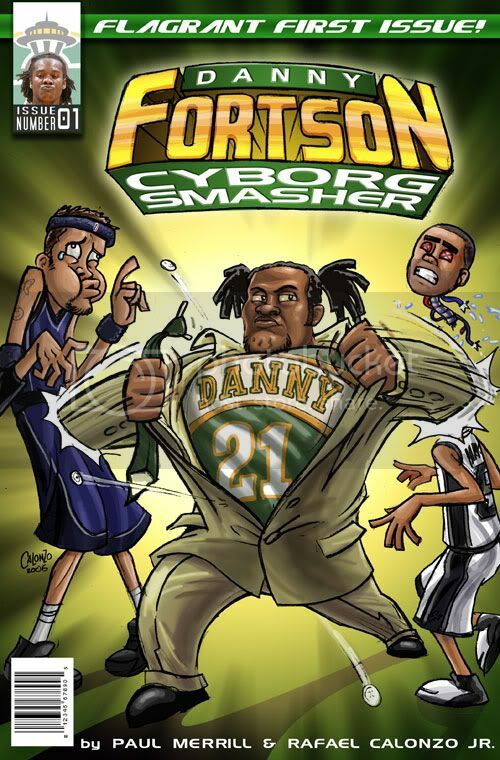 Fortson is the only real enforcer on the team. Without him, we could not keep teams honest, or afraid to go into the lane. Besides the Potato, he is the only guy with girth, all the rest of our bigs are tall and skinny. And he scares the crap out of the guards. You never know what he is going to do next. Just ask Ginobli or Parker. Doesn't Danny's contract expire after this year anyways? Maybe it's next year. I say keep him. He was a stud for the first part of last year, maybe he can regain it w/ Mac10 gone. "Yesterday, Seattle re-signed guard Mateen Cleaves, a six-year veteran who played sparingly last season. Terms were not disclosed, but league sources said that only a portion of his contract is guaranteed." All right, I made a couple of mistakes in my post. First and foremost, I accidentally misspelled Matten Cleaves name -- which, I do know how to spell; it was an honest error -- which is totally my fault. Anyhow, I apologize for the errors. Okay, I'm a goddamn idiot; I tried to make a point of my misspelling of Mateen Cleaves name, but I forgot to write it as "Matten (sic) Cleaves" in my last post. I forgot to include the '(sic),' though. Oh well, mistakes happen . . .
Carl, Fortsons contract does expire this year. He is making around $6 million. AK, I gotta say, I've liked your posts a lot more since you started sounding more like an actual person and less like the Associated Press newswire I have to deal with at work. Thankfully, I am definately correct in this instance; I have, amazigly enough, even cited the source. Thank god it comes off in time for Luke, Nick and Rasard. I don't think the country boys will leave, but there might not be enough money for Rashard, who if he learns to pass, play d, and drive could command huge dollars. I really hope they figure out this Key Arena lease so that they can stop using it as an excuse not to spend. cleaves is back. he will take over the backup pg spot give him 2 months in the season.